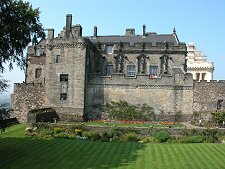 Ask just about anyone, worldwide, about Stirling, and they'll probably have heard of Stirling Castle. But don't, whatever you do, think that if you've seen Stirling Castle then you've exhausted all there is to see and do in what became Scotland's sixth city in 2002. If you take a walk downhill from the castle towards the city centre you begin to come across other treasures. 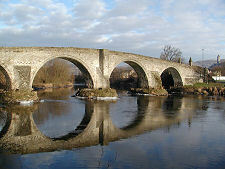 If you can drag yourself past the enticing Portcullis Hotel you see on the opposite side of the road Argyll's Lodging. Beyond Argyll's Lodging you come to the area known as the Top of the Town. This features the striking ruin of Mar's Wark facing down Broad Street towards the town, and a range of other imposing, if in some lights slightly austere buildings. Behind Mar's Wark lies the graveyard of the Church of the Holy Rude, in which James VI was crowned. Opposite the side of the Church of the Holy Rude, is the white-painted Cowane's Hospital, built in the mid 17th Century as an almshouse for bankrupt merchants. 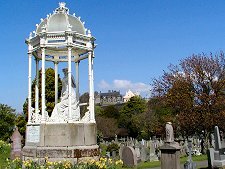 It fulfils a variety of functions these days, but is noteworthy for "Meet the Ancestors", a centre for information about the history of families originating in the Stirling area. 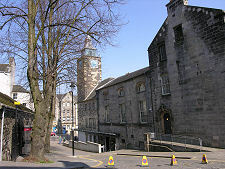 Downhill from Cowane's Hospital is Stirling's Old Town Jail. 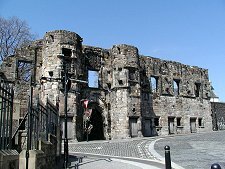 This extremely impressive building backs onto the town walls and visitors are offered superb guided tours conducted by actors who really take you back to the far from "good" old days. An entertaining but extremely thought-provoking way to spend your time; complete with some excellent views over the town. 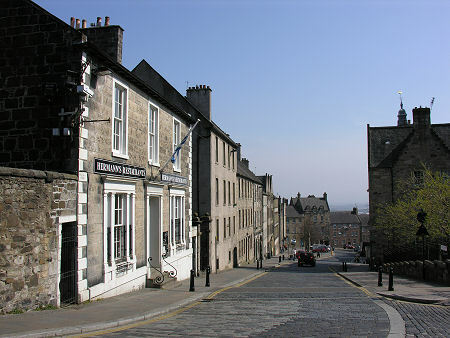 Next door and downhill again from the Old Town Jail is Stirling's Youth Hostel, backing onto the town walls and set back from the road to its front. 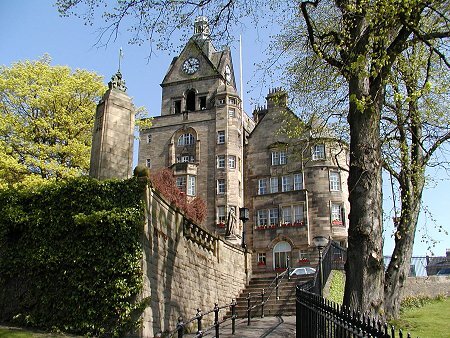 Scottish Youth Hostels are located in buildings ranging from the very humble to the pretty grand. Stirling's is definitely somewhere at the grand end of the spectrum. 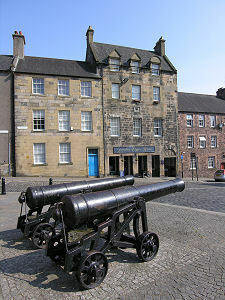 Opposite the Jail and Youth Hostel is the Tolbooth, built in 1705, and other nearby attractions include the Mercat Cross. 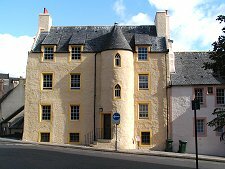 A little further down the hill is Robert Spittal's House, founded by Robert Spittal, tailor to James IV in 1530 to support the poor. 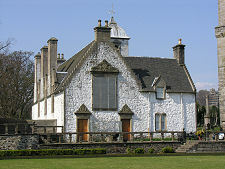 Beyond it is Darnley's House, where Lord Darnley, who became Mary Queen of Scots' husband, is said to have stayed when she was in residence at the Castle. Further downhill still and you enter Stirling's Lower Town, the commercial heart of the town and home to most of the opportunities to shop, eat or drink. 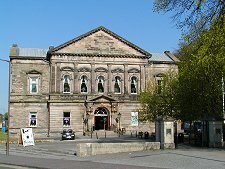 You will also find here the magnificent (but sadly named) "Municipal Buildings", and if you continue on down Corn Exchange Road past them, you come to Dumbarton Road, the home of Stirling's main Tourist Information Centre and the excellent Stirling Smith Art Gallery and Museum. 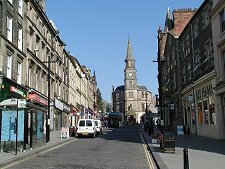 Between the Municipal Buildings and the railway station, Stirling could be mistaken for many other similar towns, with a mix of older and newer shops, a shopping precinct, and a collection of pedestrianised streets. 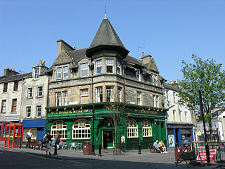 Until very recently that would have been the end of any account of Stirling, for beyond the shops lies a wide road that used to be the main route between the lowlands and the highlands: and beyond the road is the railway station, marking the line of the railway that was driven through the lower part of the town in the 1800s. But no longer, for the land beyond the railway has been redeveloped into attractive shops and leisure areas. This in turn is opening up access to the west bank of the River Forth, from which Stirling has been largely cut off ever since the railway was built. The end result is a much better balanced and even more attractive city. Looking more widely, Stirling has since 1967 been home to the University of Stirling, built three miles north of the city centre at the foot of the Ochil Hills on one of the world's most beautiful campuses.